Hold power, strength and dependability in the palm of your hand with the FX-21 Revolver SEAL Knife with Saw produced by SOG. 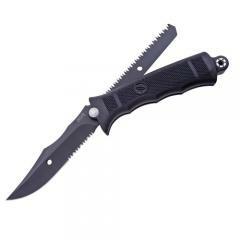 Designed to handle the toughest conditions, the knife features an ultra-durable, glass-reinforced nylon handle. Integrated finger grooves and a textured grip offer superior handling and retention in wet or icy environments. A 4.75-inch, 440A steel blade holds a razor sharp edge, while the TiNi hard-cased finish guards against corrosion. The forward thumb rest on the spine of the blade provides improved dexterity for added cutting power. A built-in, double-tooth saw serves as a backup tool to ensure any job gets done.